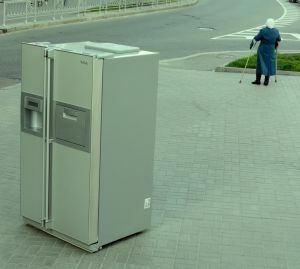 In your travels throughout the city, you probably notice a lot of big appliances outside of kitchens. They could be stored in garages, back porches, yards or sheds. The simple reason for this is that it’s very hard to get rid of a big appliance. It can go out with the rest of the trash and unless you have a truck and know where to take it, there’s nothing you can do. That is until Junk King Portland came along. One call to these professional junk haulers and you won’t have any trouble getting rid of that big appliance. As an added bonus, it can also be recycled. Sometimes people hold onto it appliances and hopes that they can repair it if it’s broken. But once it’s been replace the really is no reason to fix it. It really doesn’t matter what condition your appliances are in to Junk King. All that matters is that you want to gone. It won’t take long for the two-man crew to load up that item onto the back of their truck. If that’s all you want taken away, then it will be a very simple job. However since you have access to a working moving crew and a big truck why not take full advantage of them? This is a golden opportunity to remove all kinds of rubbish from the rest of your house. If you got debris in the backyard, then you can turn it over the Junk King. It can be something as big as a hot tub or small as a rotting woodpile. Inside the house, you might have a lot of old exercise equipment, clothing, toys, books, shoes and other household goods that you’d like to get rid of. Don’t think of that as being wasteful. That’s because Junk King Portland will make sure those items get dropped off at a charity. That way they can be of use to someone in need. Junk King’s recycling program happens automatically. It’s also comes at no extra cost. It’s all included in the flat fee that you pay for the work. You’ll know what that fee is before the job begins. After the crews have had a chance to look over all the things you want to get rid of they’ll know how to pack up the truck with it. That’s how they determine your price. It’s all about volume. You will never be charge by the pound with Junk King and that’s a very good thing for your bottom line. Big appliance recycling and junk removal is easy as take care of when that task is given to Junk King Portland. This entry was posted in Portland junk recycling, Portland junk removal and tagged appliance, junk King, Junk removal, recycling on October 23, 2017 by Junk King. Last updated October 23, 2017 .